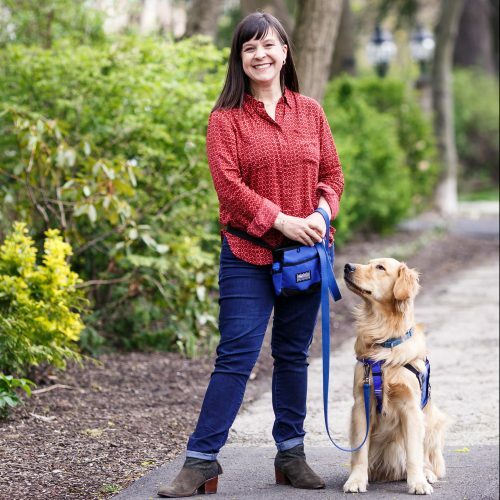 Louie works as a facility dog with his handler Kelly Raudenbush of The Sparrow Fund. She is a child and family therapist who works with foster and adopted children who have experienced trauma. Louie joins her in therapy sessions so together they can help many children and families build a feeling of safety and healthy attachments. parents and a little girl who suffered severe abuse before her adoption. Louie greeted her so gently like he knew her trauma. At one point, she stood up to work with him, but got nervous. She put her hand out in a way that was barely noticeable, just to her side. Louie walked to her and did a visit on her. It wasn’t a hug, it wasn’t a rest.